Recently, I saw a poster like this one in the hallway of an elementary school, and I was pleasantly surprised and favorably impressed: the teachers at this school are apparently helping children (young children!) appreciate a powerful lesson for leadership. Seek first to understand is one of the habits Stephen R. Covey recommends in his well-known book about personal efficiency, and, I would argue, it is a crucially important habit to have if you lead others. Think about it in terms of data sufficiency: leaders make decisions, and you need to know what others know to make a sound decision. The world is too complicated for one person to be in possession of all the facts, and the best way to get useful information is to be open to listening to others. But seeking to understand, sadly, is easier said than done. We all know it’s important to listen, and yet we also have a strong drive to state our point of view and defend it, early and often. We can moderate this impulse if we are feeling secure in a low-stakes situation, or have no skin in the game. But if the topic is important or triggers something personal, watch out. We shut down our curiosity and listening and stop paying attention to the other person’s point of view. To make matters worse, people often see the decisiveness of not asking what others think as a hallmark of leadership. Leaders need to interrupt! Real leaders don’t worry about what other people think! Right? It’s worth making a distinction here. When leaders seek to understand others, it’s important to look at why they are motivated to do it. If the mindset is, “I need to know what others know and believe so that I have a complete and accurate picture of this challenge before I set everyone on a course of action,” that is responsible leadership. If the mindset is, “I need to know what others think because I don’t want to decide something that they will see as off the mark and judge as unwise,” that is a different story. The difference is subtle – to be sure, knowing how other people will react to a decision is important data for a leader to collect and consider. But if you are motivated to know what others think mostly in order to manage how they see you, that is not necessarily a recipe for good decision making. Ellen DeGeneres once told the New York Times that while she used to worry about being liked, now she just wants to be understood. It’s a developmental path, some say, to move from wanting (even needing) the favorable opinions of others to a place where you can stand on your own authority. Wanting to be liked often means figuring out what other people like and trying to be that. Wanting to be understood means knowing who you are and hoping others will make a good faith effort to get their heads around what you are about. Even if they don’t like it, at least they got what you were trying to do. When a leader can stand comfortably in her own authority, I would argue, she is less likely to listen to others just to find out what they think of her. She’s more likely to listen to others because it helps her see the whole picture. In this way, seeking to understand others becomes a sign of confidence and strength in a leader, not indecisiveness and weakness. Seeking to understand. Seeking to be understood. Like so many things in life, it’s not an either or thing. 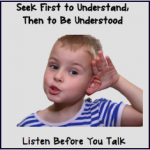 All of us need to stop interrupting and listen to others so we can learn. And all of us have a real need to confidently voice our own ideas and know that we are understood. The implication? It’s a balancing act. In every important conversation we need to take turns listening and telling. And yet, the little voice inside worries, what if I try to understand someone else’s point of view, one thing leads to another, and I never get my turn! If I seek to understand, will the other person return the favor? Isn’t it better to get the airtime up front? 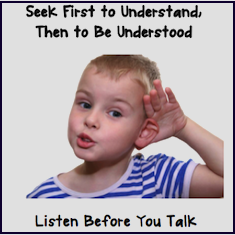 I’m going to go back to the poster on this one: Seek first to understand, then to be understood. Listening first can be a scary proposition, a bit like the risk of unrequited love – if you give it, you don’t really know if you are going to get it back. But if we can ask our kids to show this kind of bravery and generosity, we can ask it of ourselves.